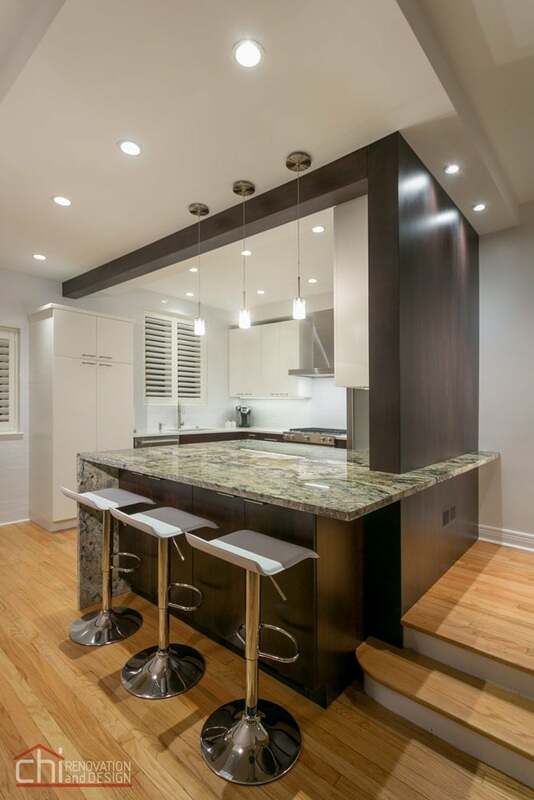 As a premier Chicago general contractor, Chi Renovation & Design offers full service, licensed and bonded home remodeling and renovation services in the Chicagoland area. Our full service general contracting covers from design to completion, so that there is single-source responsibility that ensures your project is done as planned and on budget. One of our specialties is basement construction. 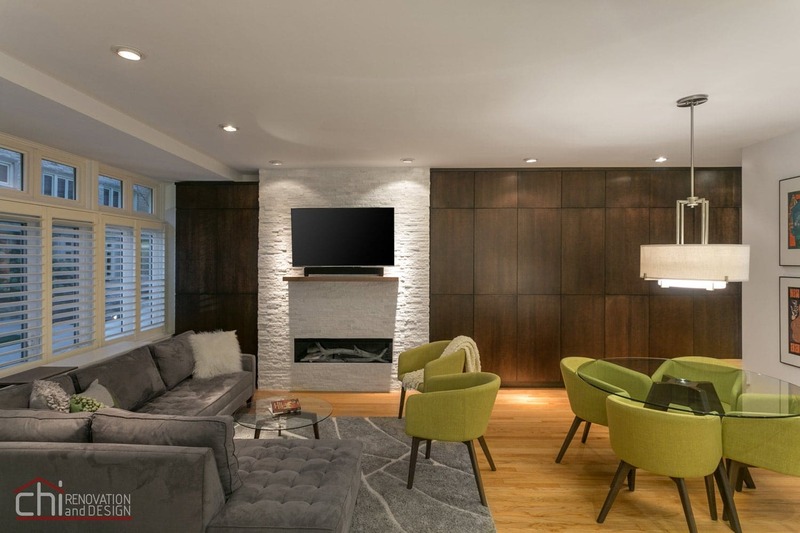 Our basement makeovers and basement renovations have been a cornerstone of our business and have earned us the reputation of being the best Chicago basement contractor. We serve Chicago, Skokie, Evanston, Wilmette, Kenilworth, Glencoe, Winnetka, Highland Park, Lake Forest, Deerfield, Northbrook, Glenview, Niles, Park Ridge, Lincolnwood, Lincolnshire, Lake Bluff, Des Plaines, Round Lake, and the entire Chicagoland area. 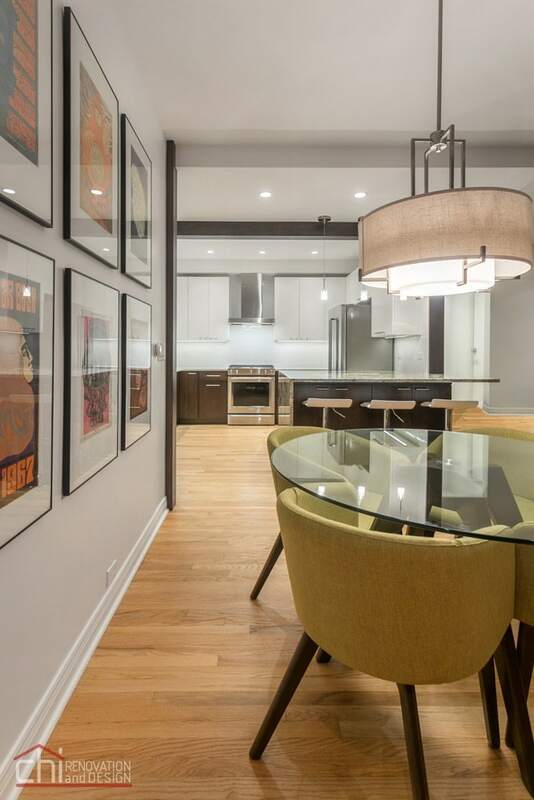 In this Lincoln Park timber loft, we remodeled the bathroom, living room, dining room, and bedroom. We have infused the loft with an eclectic modern look filled with global art, fabric, and showpieces. While we used classic whites and soft greys to make the bathroom luxurious and classy, the global fusion decor in the other rooms is a complete contrast. The bedroom features colorful textiles borrowing from the cultures of the Sahara to India. The dining room sports richly colored furniture and rug to complement the exposed brick walls and timber. The living room is made playful by utilizing modern furniture, patterns, and colors. Brimming with art and showpieces, this Chicago loft is filled with personality! In this Chicago condo kitchen remodeling project, we aimed for big results for a previously tight space. We used a fresh white color palette for the island and cabinetry to make the area appear larger. 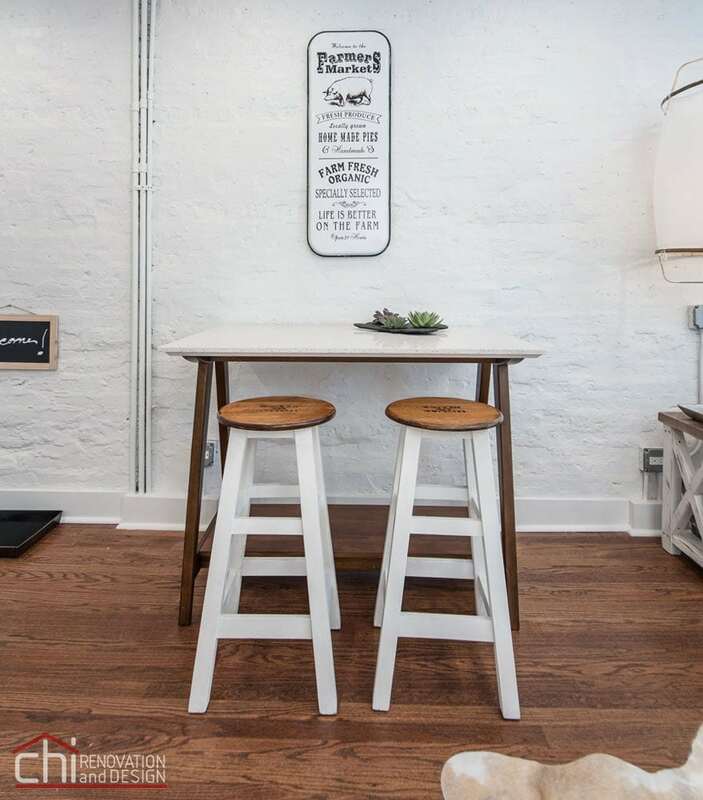 The island was made spacious to provide the extra workspace that this kitchen requires. 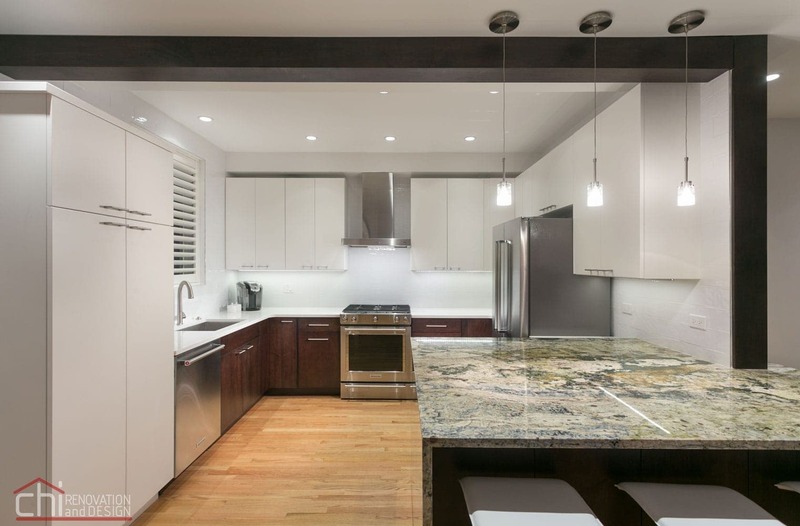 The same white cabinetry was included under the backside of the island to substantially increase storage space. The combination of the whites, steel, and soft grey walls make this kitchen a modern, classy, and stylish space. 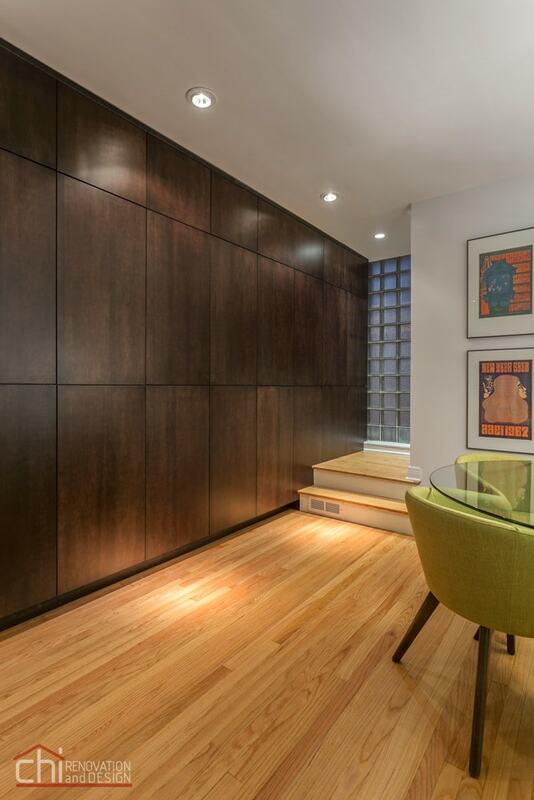 This urban condo was in desperate need of updating. We gutted the entire unit and then built out a long and narrow kitchen to keep the rest of the great room spacious. We designed the rest of the great room, including dining and living spaces, to both be distinctive spaces. The study as well as the two bedrooms have unique personalities, reflecting the homeowner’s sense of style. Dog-friendly materials were used throughout. We designed and built this beautiful shabby chic studio loft in Chicago with a love for the past, sourcing vintage pieces and retro-styled appliances. 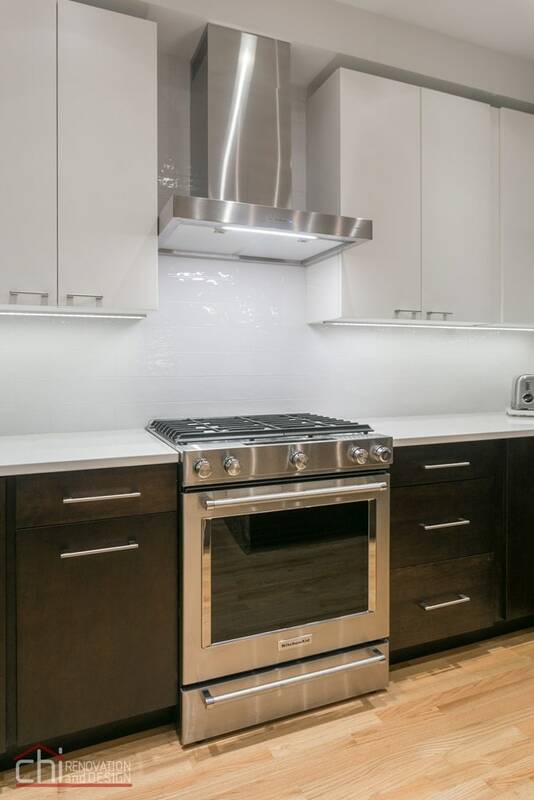 Starting in the kitchen, we utilized beautiful zinc alloy countertops that are complemented by gorgeous antique mirror backsplashes. There is a lovely throwback SMEG 50’s refrigerator and the shelves are all reclaimed wood. This antique lumber detail can be found throughout the loft, from the floors all the way to the night stands. We reclaimed original bar stools from the iconic House of Blues for enjoying that morning cup of coffee. 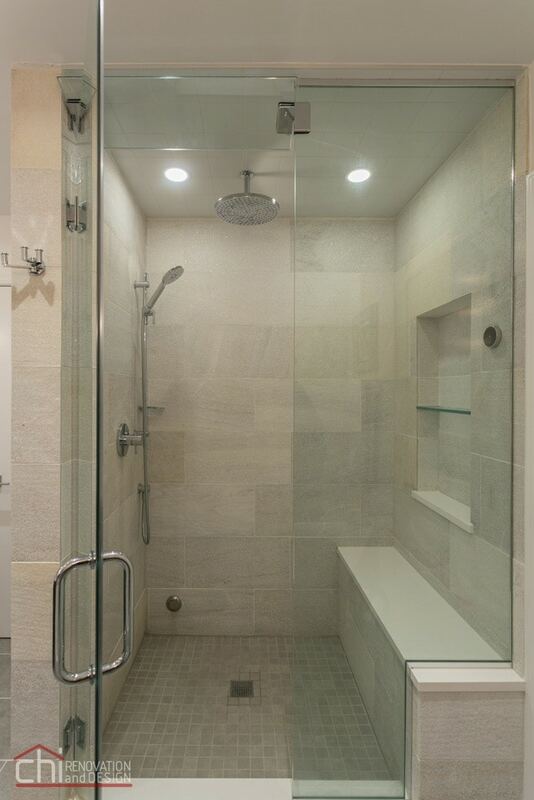 The bathroom door is salvaged wood, the mirrors antique, yet the shower fixtures are all the latest from Grohe. 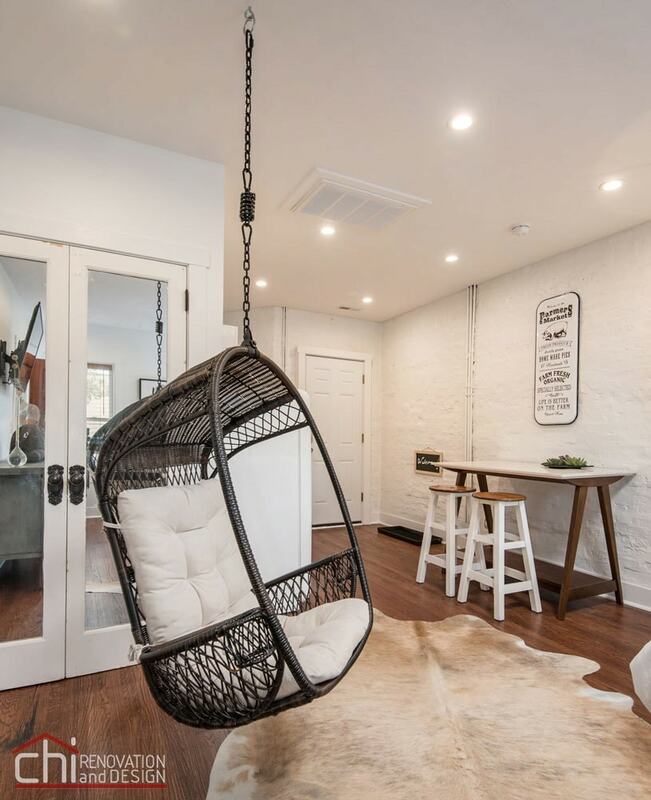 The funky wicker swing chair is new, and the closet doors are vintage stock originally from NY’s Plaza hotel! 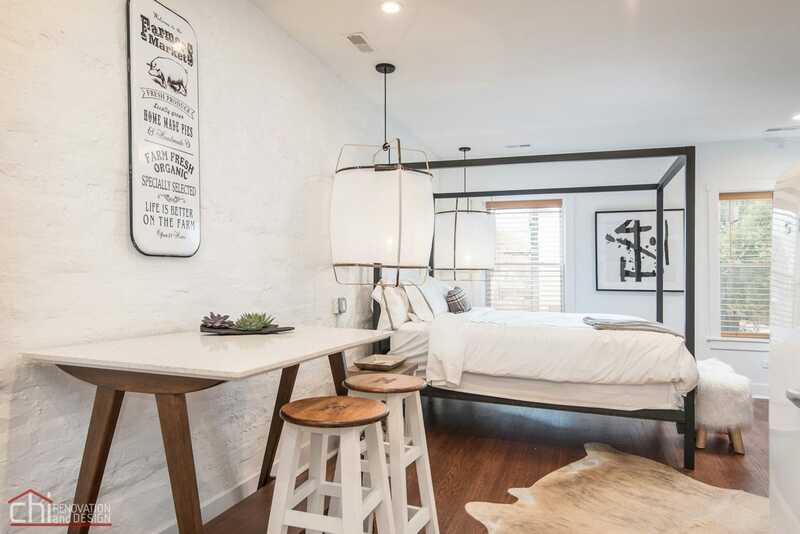 All in all, this project is a wonderful mix of vintage and modern pieces designed to be the perfect trendy urban crash pad. Designed and sourced by our design team. Built by our own tradesmen. A true one-stop-shop experience that allowed us to do the job quickly, efficiently, on-time, and on-budget. Our clients wanted to update their Chicago home interior to a design that rung true to their unique tastes. They hired us to completely renovate the kitchen, bathrooms, living room, and master bedroom, which we had great fun in doing! We wanted the home to take on a contemporary style with personalized touches, through tiling and lighting as well as a few major changes to the floor plan. Our team was able to move the kitchen and the powder room to completely different sides of the home. Additional room was made available in the kitchen by removing a load-bearing wall and installing a 14 foot long load-bearing beam. This added space allowed us to create a brand new “super island” with ample seating and cooking space. 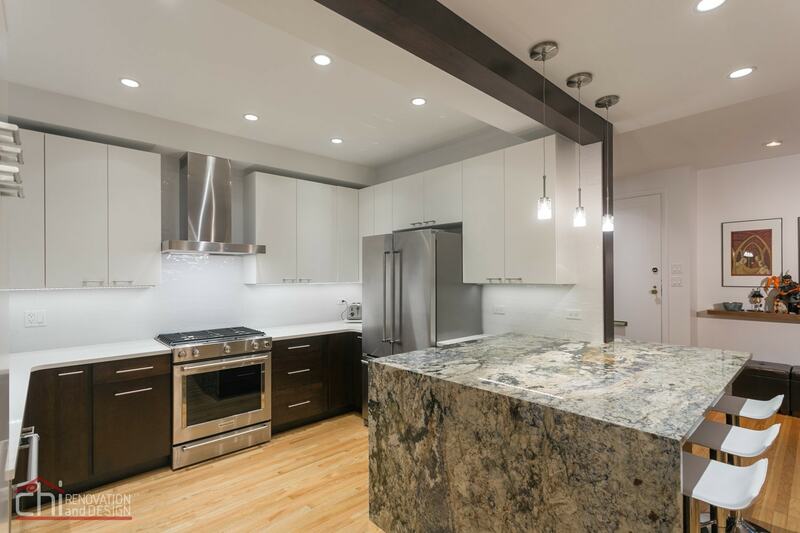 Other changes included new pendant lighting, LED cabinet lighting, new appliances, and custom fitted cabinets. The powder room now boasts artistic floor-to-ceiling tiling and a brand new pocket door system. 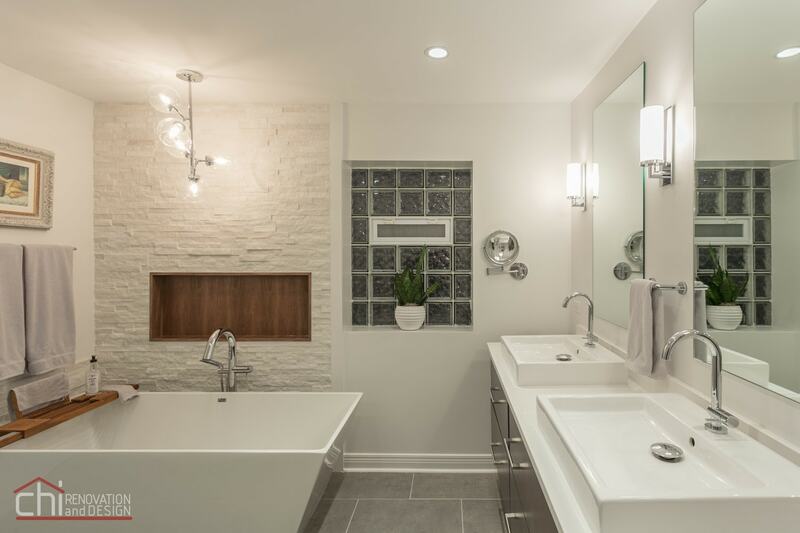 The completely remodeled master bathroom features Moroccan tile flooring and a custom floating vanity. Other home improvements include freshly painted interior walls and refinished floors. 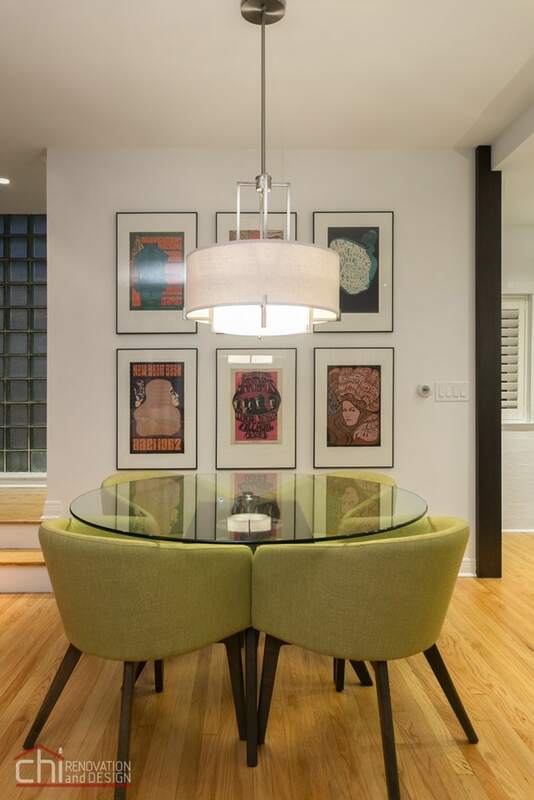 Artful living was a driving factor in this full renovation. Our client’s love of art and elegance shines through in every aspect of the design, from their curated collection displayed throughout the hallways, bedroom, and kitchen, to the bold patterned wallpaper and decor.With their artwork taking front and center stage, we opted for dark neutrals throughout, using a combination of charcoal and heather gray, black, white, and beige. A few accent pieces boast lustrous gold and silver hues, adding glamour and elegance.We integrated artisan lighting, ranging from traditional to modern styles, which enhance the client’s unique tastes and tie together their artful and contemporary design. 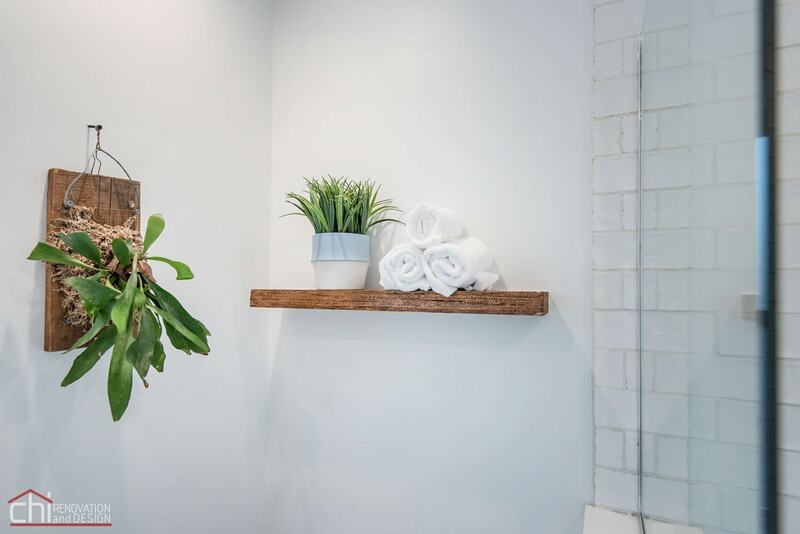 We remodeled this studio apartment to create better flow and function. Studio apartments can be tricky as they basically fit the entirety of a home into one large room. We wanted this studio to feel as though there were separated spaces, such as the kitchen, study area, bedroom, and bath. The kitchen is a pretty impressive size for a studio, as well as the bathroom and sleeping area. We made necessary adjustments to the layout of the home, with enough space for a small dining table and chairs and small office area. These changes, although small, really add to the function of the space. From the large, organized kitchen to the multipurpose living room/dining room to the unique bathroom, we made sure this home exceeded all expectations including enhanced functionality to original personality and style. We gave this Chicago apartment an exciting new feel! A modern interior with retro mid-century modern undertones, this home boasts unique artwork, bright accent colors, rich wooden feature walls, and plenty of hidden storage! From the large, organized kitchen to the multipurpose living room/dining room to the unique bathroom, we made sure this home exceeded all expectations including enhanced functionality to original personality and style. A clean and modern remodel we completed for this rental home. We wanted the design to be timeless but current, and adaptable to any trends the owner or renters may want to integrate. The living space is a large open layout, with the newly designed kitchen as its focal point. With bright white cabinets and countertops, the dark espresso hardwood floors and chocolate-toned island contrast beautifully, looking modern and not too traditional. From the extraordinary amount of storage to the diagonal placement of the sink, the kitchen has plenty of creative elements that focus on functionality and style. The two bedrooms are both elegant and simple, showcasing dark hardwood floors against a light grey-blue color palette. 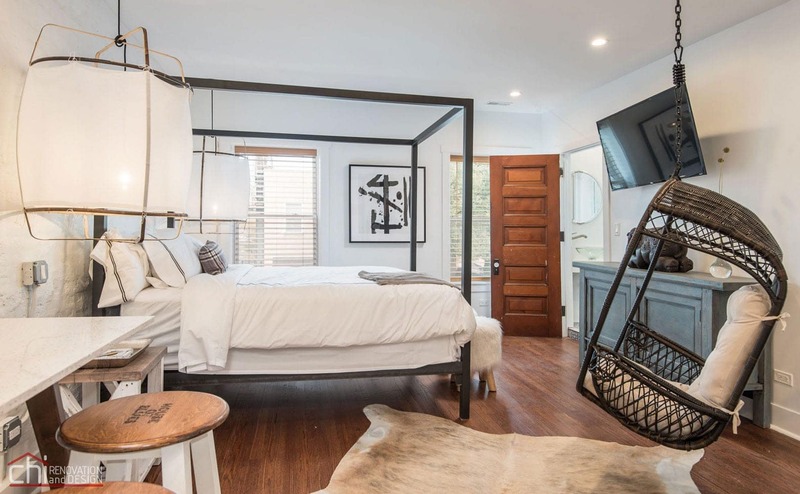 One of the bedrooms leads to a uniquely designed bathroom with beautiful herringbone tiled floors, a large walk-in shower, and modern vanity. The other bedroom has a clever door that leads to the large (and newly built) deck. 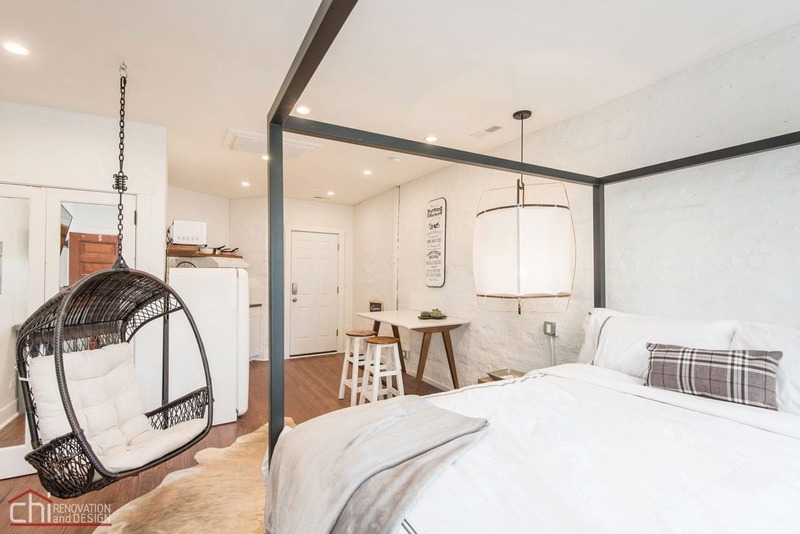 An open concept studio apartment we completely gutted, renovated, and designed to be used as an Airbnb rental. The modern industrial feel is accentuated by the exposed brick walls, which add unique warmth and and an exciting aesthetic. The furnishings were kept simple but unique, with each piece having its own look and creating a contemporary eclectic design. This glamorous home was finished off with a chic black and white bathroom featuring a stunning gold vanity mirror – simple but elegant! This cheerful attic with high ceilings is now being used as the master bedroom in this client’s home. This space is bright and clean, offering tons of natural sun through three, large windows. 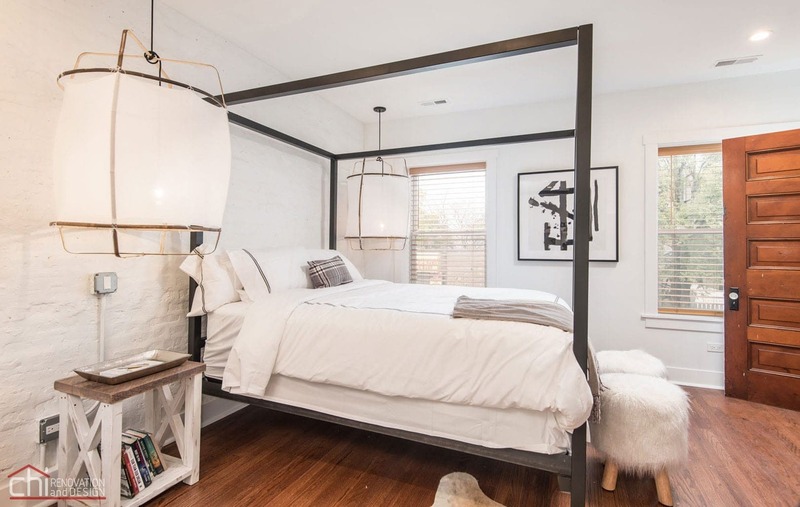 The bedroom presents quite a contrast from the industrial, antique master bathroom. We installed brand new wooden flooring that further brighten up the once dark attic. Crafting a built-in shelving unit was perfect for all their media needs, books and décor. This Chicago loft is a unique space, both in it’s layout as well as in it’s finishes, with exposed brick and heavy timber beams. These clients wanted us to re-work the living area, in such a way, that incorporated an entertainment center that complimented the overall feel of the space. 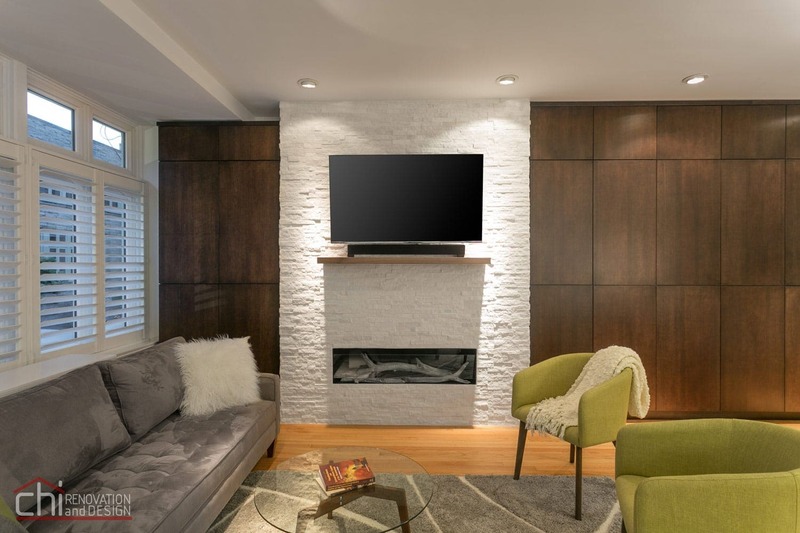 The entertainment center we designed is encased in rustic finishes with tile cladding that has precise cut-outs for the LED fireplace and entertainment system. The rustic feel is further accented by the thick wooden mantle and distressed wide-plank flooring. 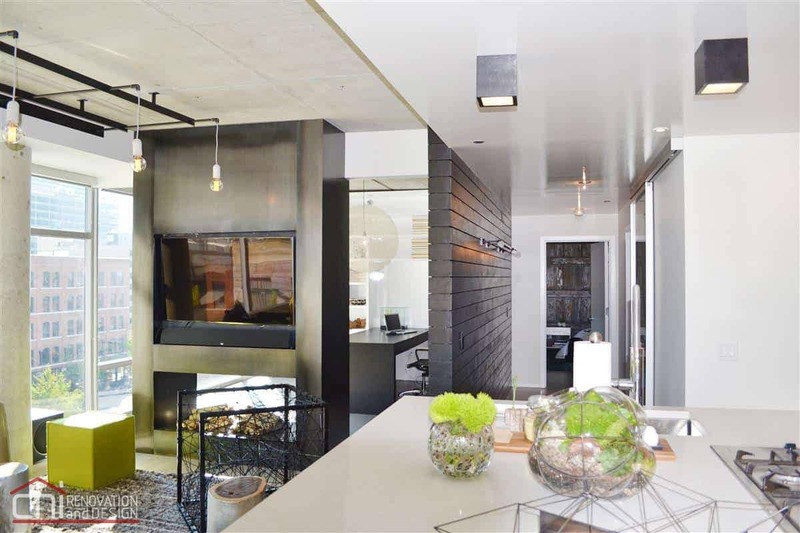 This custom-built, luxurious home office was designed with the homeowner’s needs in mind. Gorgeous mahogany shelves were built in from the floor to the ceiling to store books and match the stunning coffered ceiling. The entry way is a very special and unique piece, a joy to look at. This classic look was tied together with the green leather office chair and green window treatments. The second part of the remodel was the closet. It was custom-made to create a space easier to keep clean. The built-in shelves provide storage for a plethora of small items such as shoes, ties and cologne; there is a separate area for hanging items to keep the closet orderly. The light-colored wood and silver finishings make the space brighter. This open concept home, previously, did not have the distinction between the different spaces that the client desired. To clearly define and separate the spaces the client wanted to do a number of things, including building a fireplace with an accent wall, move an electrical fan and install a backsplash. 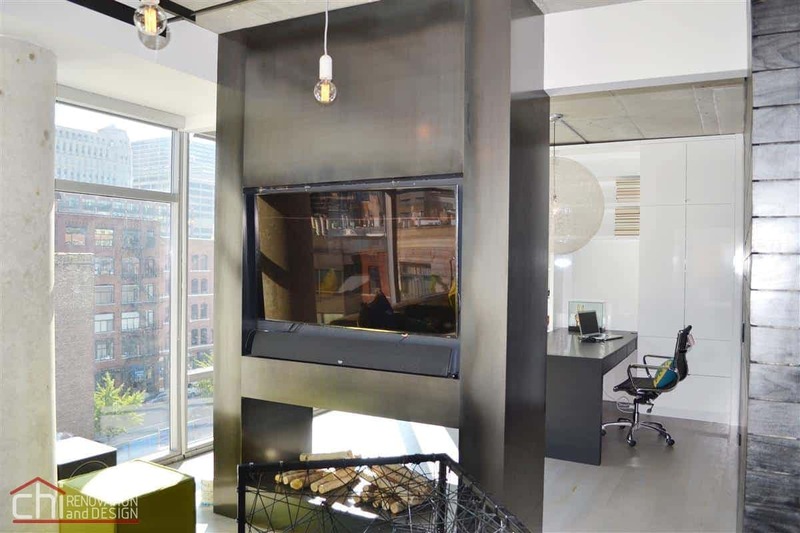 The fireplace was built in the center of the living room, including a wooden feature wall that holds a larger flat TV screen. The ceiling fan was replaced with a chandelier over the dining table, clearly identifying the dinning room from the living room area. To update the kitchen, the former, 12×12 backsplash tiles were replaced with smaller, charcoal colored, tiles for a sleek modern look. Overall, the result is a clean finish. This facelift project featured the kitchen, master bedroom, master bathroom, living room and office. In the kitchen, we added glass faced cabinets, a Moroccan tile backsplash and a new coat of paint to freshen it up. 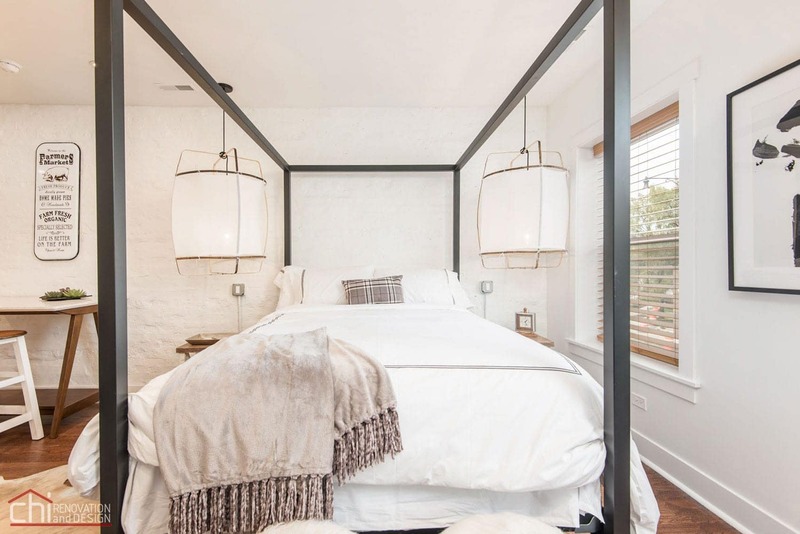 The master bedroom now exudes warmth with soft textiles, a light color scheme and rustic woods, exactly what our clients had in mind for this romantic space. As the living room already featured high-vaulted ceilings that we wanted to accentuate, all we had to install were new, giant crown moldings to complement the space. Using the spare bedroom as an office, our clients wanted a sophisticated and quiet atmosphere to work. With the rich wooden furnishing and natural light, the new color scheme was all the space needed to continue the cohesive design throughout the whole home. 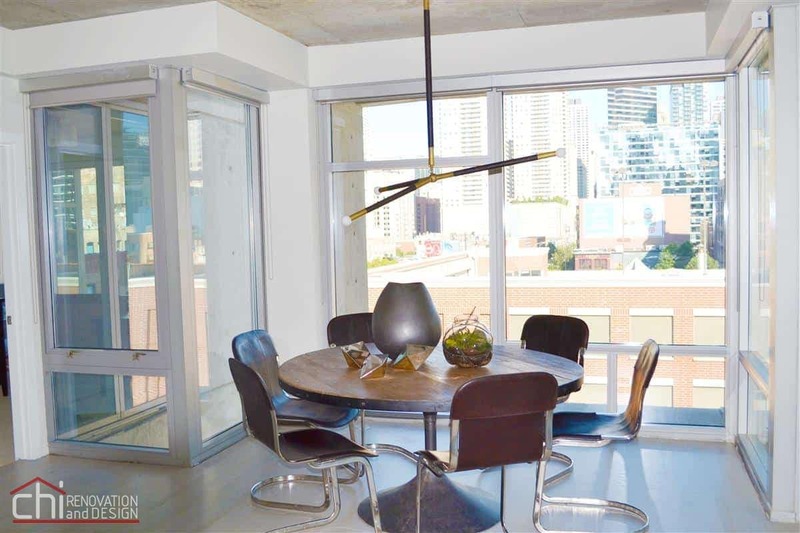 This open-concept condo got a complete revamp for the owner to use for short term rentals. It showcases some of the beautiful architectural elements and complements the homeowners eclectic style. The glamorous, gold tiled ceiling was intricately designed and put on display in the main areas of the home. The brick wall and splendid, gold contrast each other beautifully. Each of the furnishings in the home are an assortment of distinct styles fused together skillfully. 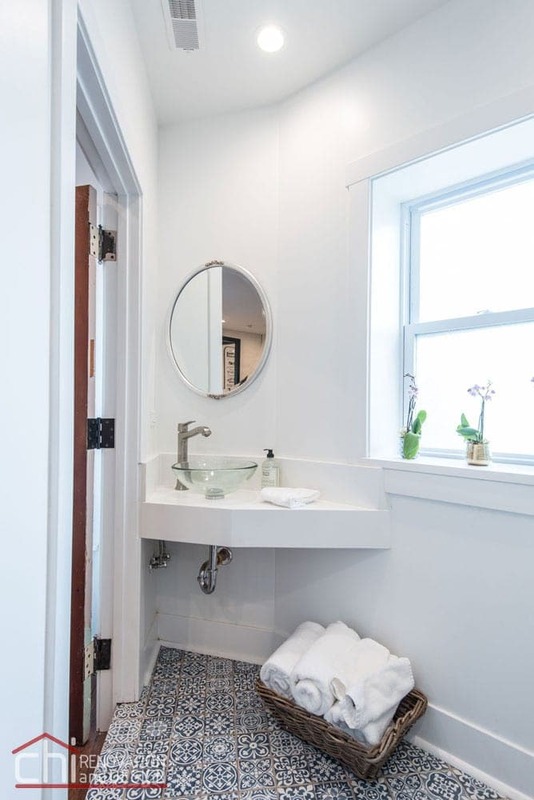 Installed in the modern bathroom is an all-white, uniquely shaped, porcelain vanity. 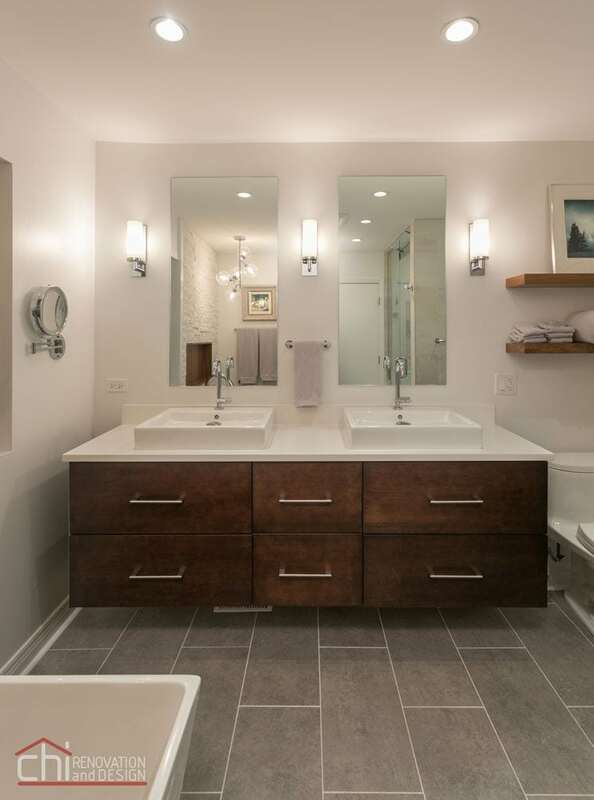 The free-standing vanity has convenient pull-out drawers while the shower is dazzled with white subway tile and grey stone tiled flooring. Building a brand-new deck extended the home and gives our clients a perfect place to enjoy a sunny Chicago day! The homeowners of this gorgeous 19th century home needed to breathe life back into a few spaces, other than the renovations in the kitchen and bathrooms we did. So, to freshen up each space we repainted. 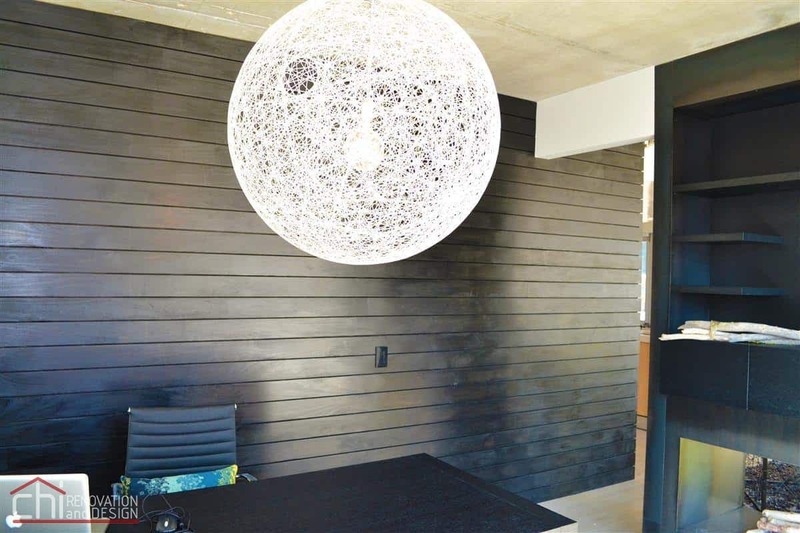 In the dining room, we retouched the paint and added a striking, floating ball chandelier. We also glossed over the master bedroom in a specialty paint for a shiny, metallic finish that contributes to the lavish feel of the space. Continuing the luxury into the walk-in closet, we installed cabinetry and an upscale lighting fixture. Likewise, the den was repainted to add to a cozy and comfortable feel to the entertainment area. Adding custom radiator covers throughout the home covered the unpleasant eye sores and enhanced appeal to their living quarters. We redesigned this outdated, wooden basement into a chic, new space for both adults and children to enjoy. Installing a custom banquette offered the clients additional seating and a great storage spot to hide toys. A fresh coat of paint really brightened up the place and made the blue accent wall pop. Adding ample storage, we installed large cabinets throughout the basement to hide even more toys! The final touch in the basement was an elegant and child friendly electric fireplace; the porcelain surrounding it gives the space a polished look. 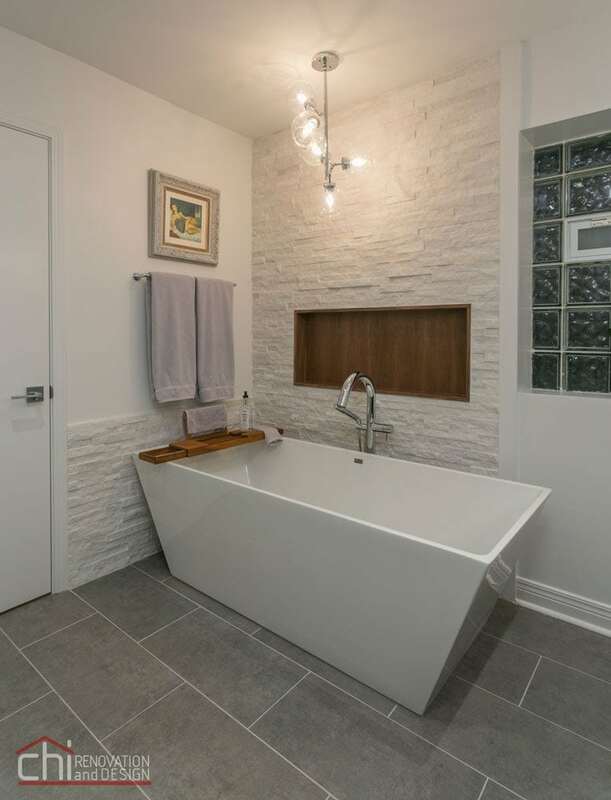 The bathroom renovation was done to fit the kid’s needs, so we replaced the stand-up shower with a full bath and added the natural stone for a visually pleasing design. The last renovation and arguably most important was the mudroom added at the back of the house. We designed a perfect place for the whole family to store jackets, backpacks and shoes in an organized fashion. 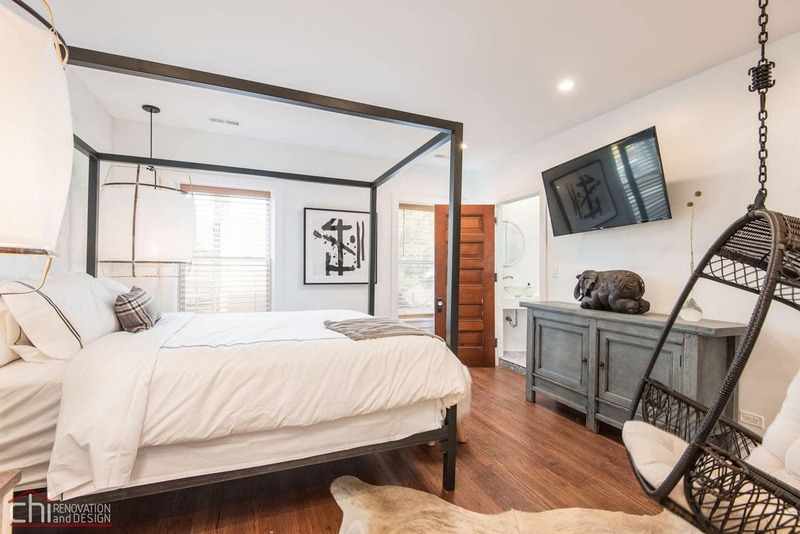 Keeping the client’s requests in mind, we wanted to refresh this master bedroom to be both trendy and welcoming. The warm, earth tones, lighting and open design will surely keep the space current for many years to come. The bedroom features a custom designed fireplace surround, a large skylight, and two attention-grabbing blue accent walls. This large space now feels stylish, and functional while still being intimate. A newly redesigned walk-in closet added more ease to morning routines when we connected it with the bathroom, instead of the bedroom. 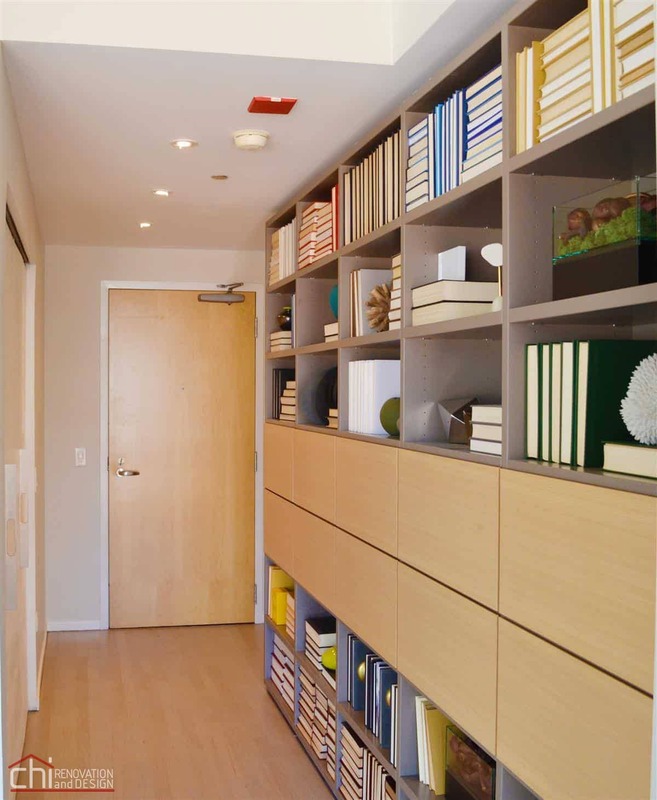 This closet has a modern design while still meeting the client’s needs of storage. The challenge of this project was re-envisioning an old, unfinished, coach house into a stylish cottage for our client in the historical district of the Northshore. Due to the historical requirements of the area, the outside appearance was to remain true to the original style, although some repairs were necessary and a few improvements were made. The two large barn doors and set of glass french doors allow the entire lower level to be opened up, to passively cool the cottage in warmer months, while the upper level takes advantage of natural day lighting with solar tubes. As there is no plumbing near the new cottage, we came up with the creative solution of integrating an electric incineration toilet to accommodate for the long hours the client plans to spend in the space. The entire cottage was finished in bright white, including the intentionally exposed ceiling structure, giving the cottage the light airy feeling the client was looking for, in order to place an emphasis on the painting and work to be done there. Our client had just bought a brand new pool table, which was supposed to be a cause for celebration at his Super Bowl party. Unfortunately, the morning of the party, his sewer backed up causing an array of plumbing issues to arise. As it was now time for some major repairs, this client wanted to give his basement a whole new look: high-end finishes along with durable flooring to cater to his 100-pound dog. We completely redesigned the entire basement, to open up the layout and make ample room for a spare bedroom, bathroom, pool table, bar and full-size kitchenette. 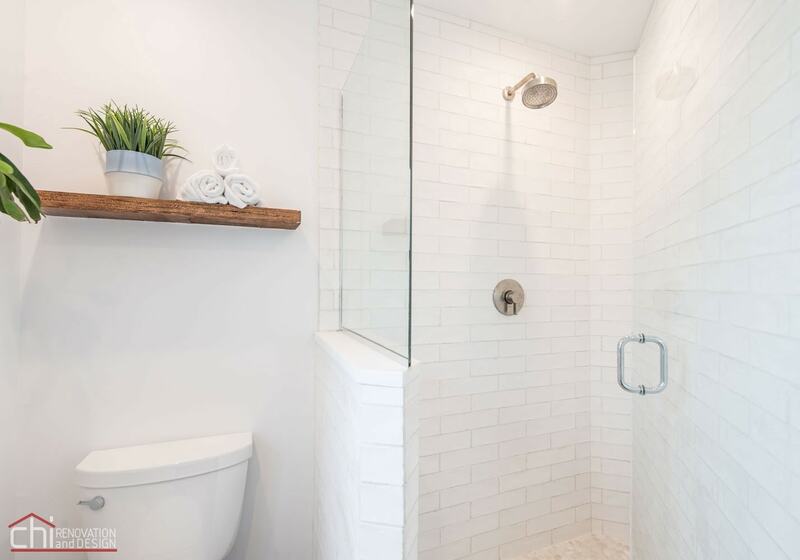 The bathroom, which was the main cause of the sewer issues, had repairs done according to city/township codes that allowed us to redesign the space for a large walk-in shower, with slate walls and flooring. The kitchenette, complete with a fridge and sink, was custom made to match the colors of the new pool table. Last but not least, we built a brand new deck, approximately 12 x 16 space, leading up to the second level. These homeowners desired a custom library with unique features. This library was designed and built to a custom height and width, to fit the exact space. The stained cherry wood cabinetry was designed with adjustable shelving and file drawers in the center, complete with a custom rolling ladder that conveniently locks, when someone stands on it. The open shelving unit, also made from cherry wood with a stained finish, has space for a flat screen TV and extra storage below. With the pre-existing hard wood floors and the new, large, custom wooden bookshelves, the overall look of this library is very classic. For the second project, the client showed us some examples of what he was looking into for his banquette. We designed a custom maple wooden banquette in an L-shape so there would be seating on two sides of the pre-existing table. For storage, we installed some pull out drawers under the seating. As a final touch, we painted the maple wood a bright white finish that contrasted well with the rustic dining table and other décor features throughout the space. 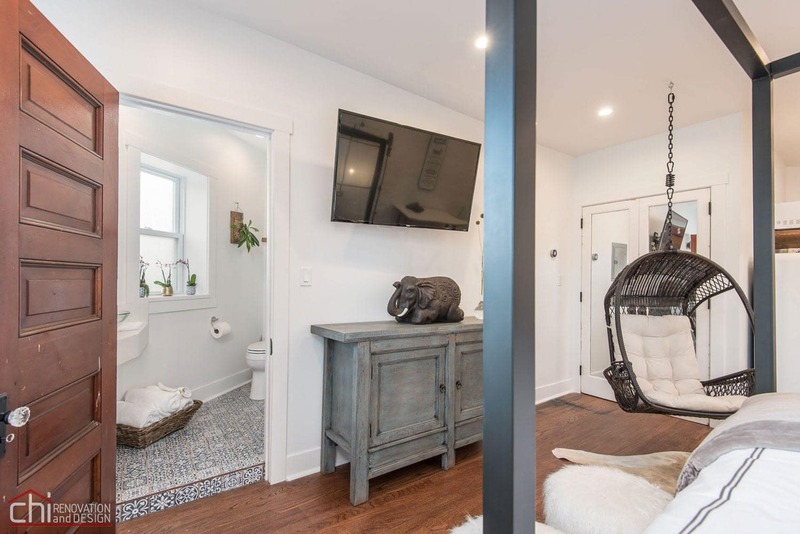 This unique, older Evanston, home was in need of a major renovation due to only one shared bathroom between the bedrooms. The clients wanted to update their master bedroom and find a means of incorporating a master bathroom. We did a full gut of the space and constructed a brand new ensuite in the master bedroom. During construction, we discovered old wooden flooring underneath the existing carpet. While heavily damaged, we were able to restore the original hardwood flooring in the space. We added custom molding accents throughout the bedroom to match the existing details throughout the rest of the house. As an accent piece, we incorporated the same level of detail into a corner niche on the exterior of the new bathroom complete with glass shelving and recessed lighting. This client owned a property in Chicago’s Gold Coast area that they were looking to rent out. They came to us for help to renovate the space in order to best utilize the prime location while keeping their expenses down. We were able to make significant improvements to the unit, as a whole, while staying within the client’s budget. We completely renovated the kitchen with white shaker cabinets, new countertops, under-cabinet lighting, and a glass tiled backsplash. The rest of the unit was updated with new flooring, base-boards and a fresh coat of paint. Our client had no problem finding a tenant, for the improved unit, when we finished the renovation. 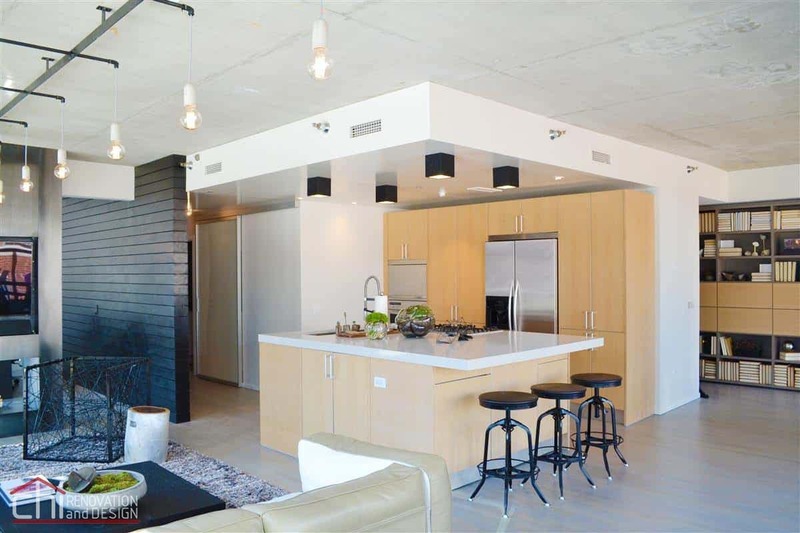 This Chicago condo renovation provided us with a unique opportunity to transform the unit into a contemporary space with an open floorplan. 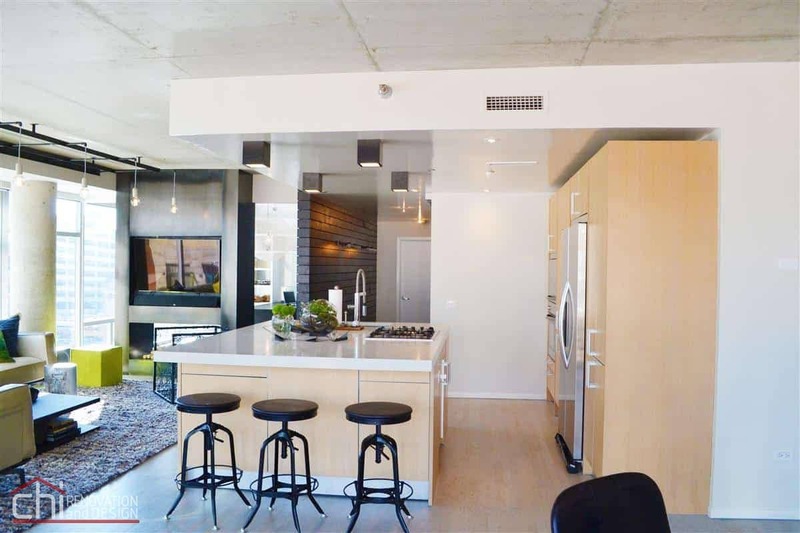 The open concept allows for free movement between the spaces, which are distinguished by unique architectural elements, such as ceiling height changes and accent walls. The kitchen features floor to ceiling storage along the backwall as well as a large island with seating, the hallway behind, contains additional matching cabinets and shelving. The living space is separated, visually, from the home office, by a modern metal entertainment center with additional shelving built into the back. The office contains floor to ceiling storage, shelving as well as a built-in desk that matches the flanking wooden accent wall. 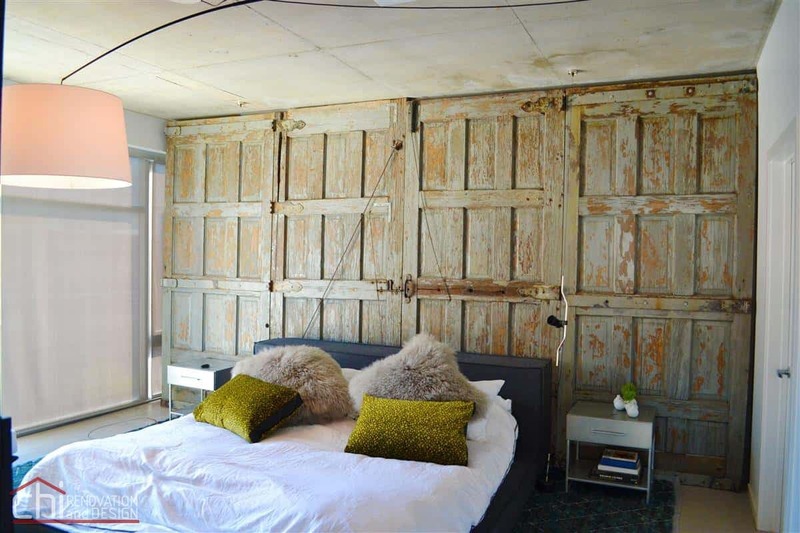 The accent wall defines the hallway to the master bedroom, which features reclaimed barn doors and hardware as the key focal point. 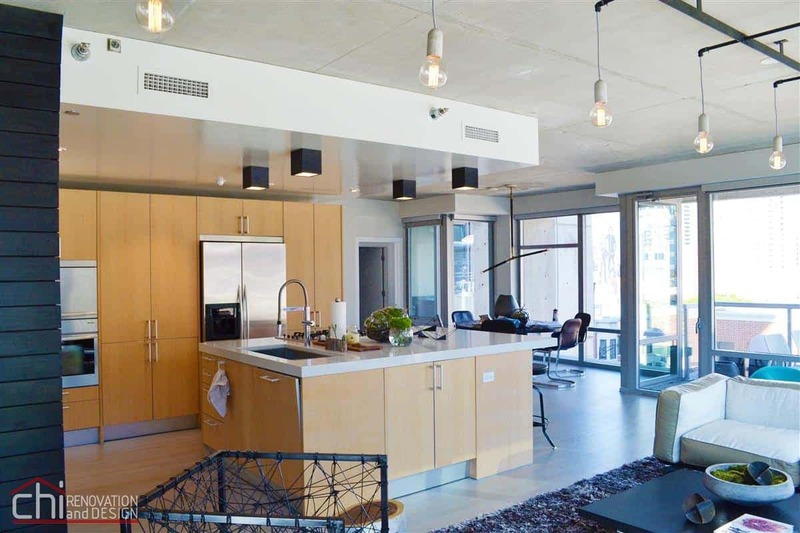 This unit is in the perfect location for a walk-out rooftop deck, with a fantastic views of the city, unobstructed by other buildings. Incorporating the same decking up the side walls allowed us to seamlessly integrate planters, benches and an outdoor kitchen. We designed a series of planters along the exterior walls to bring a touch of the surrounding greenery to the deck itself, as well as a built-in seating area complete with a new gas fireplace. The outdoor kitchen takes advantage of the roof overhang and contains a built-in fridge, sink and grill. Both the kitchen counter top and fireplace are finished with custom poured concrete slabs.